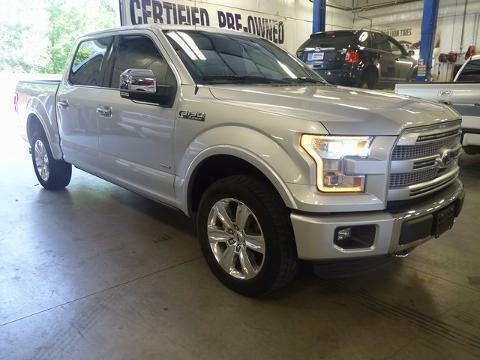 NICE xxxx FORD F 150 CREW CAB PLATINUM FX4 WITH 3.5L ECOBOOST ENGINE. THIS TRUCK HAS LOTS OF EQUIPMENT. SUNROOF, NAVIGATION, POWER RUNNING BOARDS, BED LINER, TAILGATE STEP, BACK UP CAMERA, LED LIGHTING IN THE BED, TRAILER TOW PACKAGE, HEATED AND COOLED SEATS, SONY STEREO PACKAGE, REMOTE START, KEYLESS ENTRY. CALL OR STOP BY FOR A TEST DRIVE!! ---- IF WE DON'T SERVE YOU, WE DON'T DESERVE YOU! Seminole Ford proudly serving the following communities Seminole, Shawnee, Prague, Tecumseh, Wewoka, Holdenville, Wetumka, Ada, Norman, Stroud, Okemah & Meeker.